Blueberries are still in season (barely) which means they are the perfect compliment to your oatmeal. This oats recipe gets its sweetness from our Pastamore White Balsamic with Pear Vinegar, and chia seeds and cacao nibs provide a nutritious crunch. You can sweeten the oatmeal as needed (honey would be great), but I found it sweet enough with just the white balsamic vinegar. 1. Add water to medium pot and bring to a boil. Add oatmeal and reduce to a simmer. Season to taste with salt and sweetener. Cook until water is absorbed and oatmeal is tender. 2. Remove from heat and add 1 Tbsp of Pastamore White Balsamic with Pear Vinegar. Mix well. 3. Rinse blueberries and place in small mixing bowl. Add 1 tsp of Pastamore White Balsamic Vinegar with Pear and gently mixed. 4. 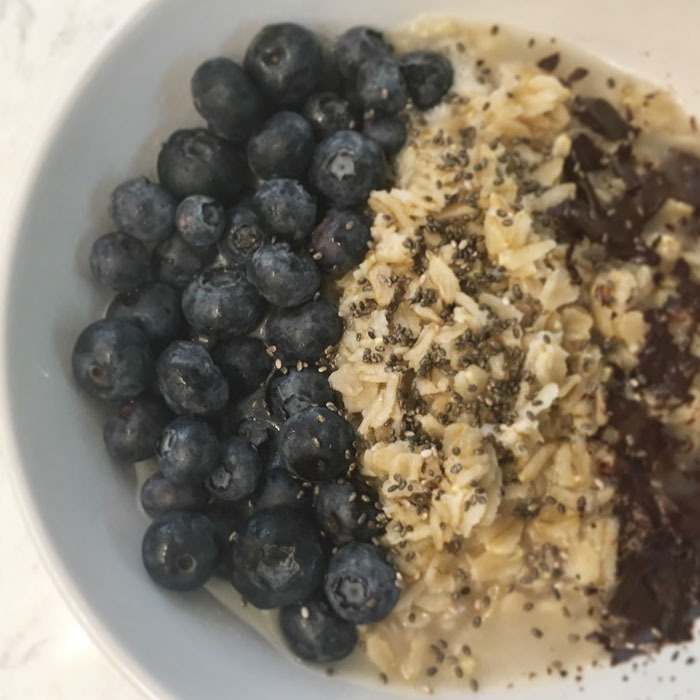 Add oatmeal to bowl and top with blueberries, chia seeds, and cacao nibs.